running barefoot in central park. 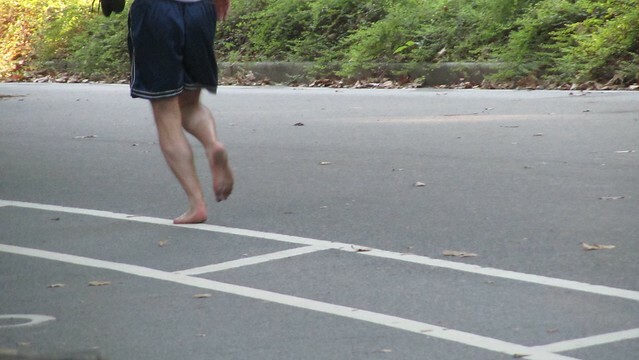 In Austin, I first got wind of barefoot running as a trendy thing that hip people were doing when I saw some college students wearing Vibrams to class. Seriously, when Vibrams replace flip-flops you know there is something going on. Then there were regular minimalist runners on the trail. One guy in particular frequently ran in sandals with straps that wrapped around his ankes while another with full leg and sleeve tattoos preferred the Vibrams, some shorts, and nothing else, I guess his full body art was enough. Anyway, while wandering Central Park recently, camera at the ready, as is my modus operandi, I spotted this guy running barefoot. But not in Vibrams or sandals, he was actually barefoot. Now I wish I had followed him (not that I could keep up) so that I could see if he avoided certain rocky areas and if he walked home barefoot and did he have shoes hidden somewhere? As I was walking to my train this morning I imagined what it might be like to run in my flats, clearly it would be possible but would I enjoy it? would I break something with the force of my impact? Lately, I’ve had a hard enough time at just walking in my flats. I had an embarrassing fall on some granite steps last week, I didn’t roll down the steps or anything but still falling is embarrassing all on it’s own. One second I was walking and the next I was on the ground, no idea if I stumbled or slipped or missed a step, I just know I was suddenly not standing and my shin hurt big time. The bruises still hurt but not as much as last week and so maybe I should focus on balance and core on this endeavor? Now for the hard part. follow through. I feel like I’m barefoot. This entry was posted in everything i've blogged, locations, observations and tagged Central Park, exercise, running, walking. Bookmark the permalink.